Stop teasing!!! !...I mean KEEP teasing!!!! Man, that school painting is so great. I wanna see this thing! Shane, I know you get this from everyone, but damn dude, this looks amazing and your work is always inspiring, thanks for showing. These are great! Thanks for sharing them! Hope you'll post more keys and backgrounds from the show. Man, all this looks so good. I'm dying to see it! And I love your choices of favorite music on your profile, Shane. We have too much in common (prince, dj shadow, 80's music....). get in contact with me if and when you can! Hey man .... well what can i say that is not obvious? u guys did a very very good work. one question? is that animated in the traditional paper way? I just wrote a long comment and lost it so this time I'll just say~ you're amazing~ If I arange dinner with Tiff do you think you can make it? Tammy and I woud love to see~ and you must see my new little one .. AWESOME! When are we going to get to see this animated. :P Where can I find out more about this pilot ? Wow! Amazing stuff, I hope this gets picked up! Looks tip top !! Fabulous work Shane !! Amazing stuff as usual Shane! LOVED the screening! Thanks for checking out my Wubbzy clip! it's a cartoon right, so does that mean a year or two? great background stuff! love those trees! Man; sorry I couldn't stick around--looks amazing! what's with the coonskin cap tho? hope we can see it somewheres soon! Hey everyone! Thank you again for all of your comments, interest, and support. We are very excited to show you all of these teaser images , but as a lover of animation and film it is killing me that we can't just play the entire 22 minutes on a blog to show what this is really all about. Like I have mentioned in previous posts, Shannon , Andy and I really wanted to do something different with the TONE, PACE and LANGUAGE of an animated television show, wich you can only get by watching the actual short. It's not Sponge Bob (Wich I love!) and it ain't Samurai Jack(Wich I adore). It's truly its own entity. Screwball action adventure Sci-Fi with heart. And by "heart" I mean you actualy care what the hell happens to these characters.Maybe we can get a clip or two up in the future , but for now stay posted. 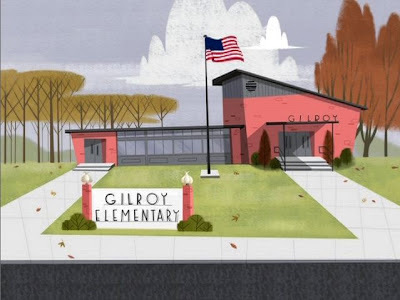 And to answer DANCING PLATYPUSS- Project Gilroy was animated Traditionaly By Rough Draft Korea. The original intent(when we pitched this 3.5 years ago) was for the Fosters flash crew to animate the entire short.We believe that the Fosters crew is the best T.V animation crew in the world, Flash or not, so we wanted to see what they could do.The crew was frothing at the mouth and so were we. But Then someone decided that it was not going to happen(even though they had the time to do it). So we demanded Rough Draft and one of the crews that animated Samurai and Clone wars. We were lucky enough to get director Ko. They did a really beautiful job. Hopefully we can show some of there handy work to you all in the near future. Really nice work Shane. Love your blog. Great designs!!! it is sooo cool! i love that special cartoon style! Holy crap it just keeps getting better, these pics are awesome dude! Now that's some sweet designs. Nice work! These look super nice - nice colours and sharp design! Wow, those works are amazing. Really Really Inspiring work here.This stuff looks amazing. Your posts are always a great hit of inspiration when I need it! Can`t wait to see what you post next! I`ll have to add you to my list `o` links. BTW Thanks a lot for the comments on my wee museum of delights! COOL! love the x-ray skeleton. Thes are soooooo cool! i really like the house. All of this is beautifully designed stuff. Glad I came across your blog. Wish you well with your baby. Very cool, Shane. Gilroy needs to come out...NOW!